Before I document how long it takes for a black eye to heal, I had better first explain how I landed myself with a shiner. Actually a shoddy landing was responsible. Eyes full of question marks followed when I went out in public, poor Cliff was afraid to go anywhere with me, when people see a woman with a black eye the first assumption is that her partner is responsible. Well I managed this all on my own. Visiting CT my eldest son Heath stayed in the Wendy house raised on a wooden deck with stairs, at my brother-in-law’s home. It is in a dark corner of the garden and has no electric lighting. Dark and clumsiness conspired leading me to faceplant. The taste of blood in my mouth was the first indicator that some damage was done. 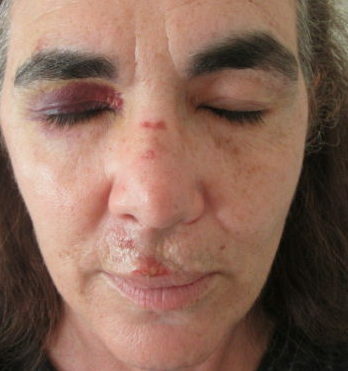 Fortunately the incident did not include concussion which I’m not a stranger to. 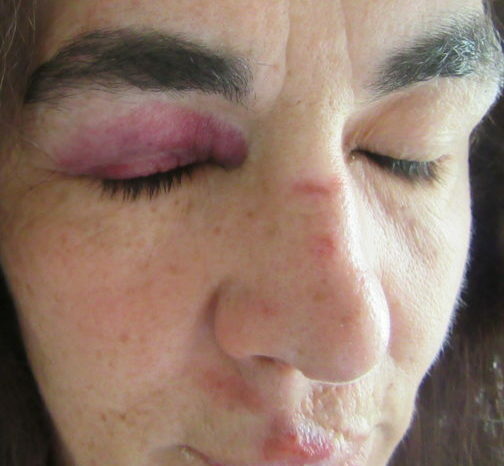 Within minutes an egg of swelling came up on my eyebrow which I treated with an ice pack before going to bed. Day 2. 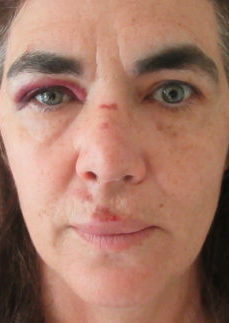 The black eye was still very swollen but I could open my eye more. Continued with ice pack treatment on and off through the day. Day 3 and 4. 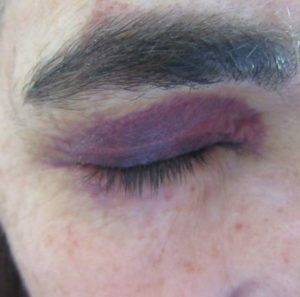 The colour of the black eye became a darker shade of purple (My sister in law said that it brought out the colour of my eyes). 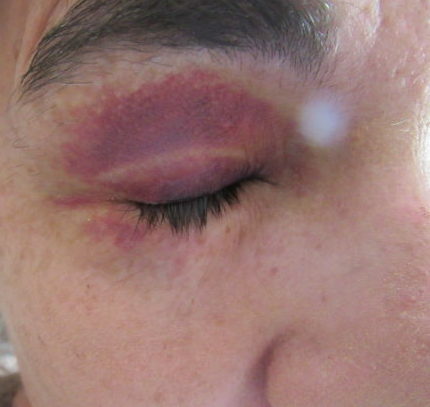 Although not evident in the pictures, bruising appeared below the eye above my cheekbone, this darkened for a a few days and then faded a day after the black eye had healed completely (11 days). I started to apply vasaline to the grazes on my face and it worked wonders, within 2 days there were no more scabs. 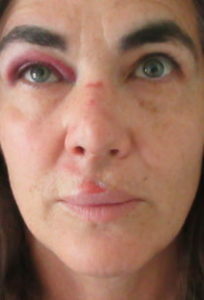 Days 7 and 8, the black eye continued to fade. If touched the eyebrow still hurt a little. I rubbed it with a little arnica oil. Day 9 we stopped at Alcare Aloe on our roundabout drive home from Cape Town. The helpful lady suggested Aloe Gel for bruising, which I bought and applied a few times during that day and the following. I’m not sure if this aided healing but got the impression that it did. 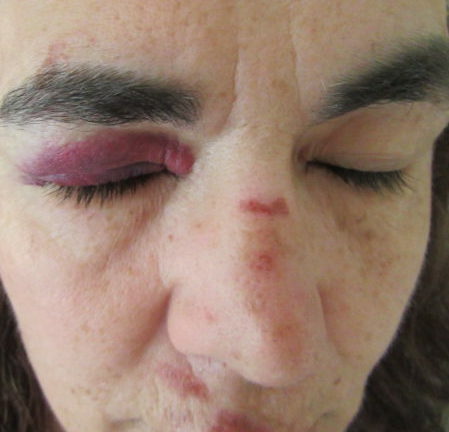 By the end of the next day there was no longer any sign of the black eye other than the faint mark under the eye. Oh looks awful Sula! I remember this it has happened to me twice now… but it’s amazing how it changes colour and shape.